I have always felt there’s something wrong with the way we do death in Britain. Recently I attended the funeral of a relative, having been told specifically not to wear ‘sombre’ clothes – i.e. mourning black. I don’t know if this was a requestof my relative, or of the immediate family, but anecdotally I’ve seen it become an increasing trend at funerals over the last twenty years. Alongside this, again only in my experience, I’ve noticed the decreased length and formality of funerals in general, and heard lots of people say things along the lines of ‘let’s not be miserable, he had a long life’ and ‘she wouldn’t have wanted us to make a big fuss.’ I imagine that many people would concur with such sentiments, and have said similar things. I think it’s wrong. Here’s why. I was relatively old when I first met Death face to face. I was twenty and my father died. We had a tiny funeral with my immediate family only; a handful of people. Living in Wales, and this being 1989, we had to send Dad’s body to England to be cremated, and have a casket returned that we could bury in the non-denominational graveyard in our town. At the time I was immature, naturally not thinking clearly, and this was my first brush with Death. I found myself doing surreal things like helping my mother design a headstone when a few days before I’d been sitting in the university library trying to understand the labour theory of value. I suppose I was not in any position to decide how we should bury my father, but a seed was planted in me which has grown over the years into a critique. That seed was the simple realisation that no one wants to talk about death. After I became a writer, I often dealt with death in my fiction – sometimes less, sometimes more explicitly. In The Foreshadowing, for example, I asked whether, given a premonition of death, one could do anything about it. In My Swordhand is Singing, based on the oldest eastern European (predominantly Transylvanian) folktales about revenants of all kinds, there’s a not too hidden message that unless we accept the inevitability of dying, we are never truly free to live. Much of the superstition around ghosts, vampires, werewolves etc. is that they return to complete an ‘unsatisfied’ life. Hence the still extant ceremony in Maramures, known as The Wedding of the Dead, in which unmarried corpses are married on their funeral day, in order to prevent them returning to the living world later on. Life can be long or short, but it is marked by few indisputably significant turning points. Two happen to all of us – we are born, and we die. We make enormous fuss of the arrival of a new person into the world, and rightly so. (And think of the fuss we make of weddings!) Yet increasingly, it seems we want to reduce the final ceremony in a person’s life to as brief and painless a moment as possible, but in doing so we rob ourselves of something important. We reduce the possibility of mourning successfully. Readers of this site will know plenty about the Victorian attitude to Death, with its extensive mourning periods, black garb and so on. Despite the obvious failings of the Victorian method, I think those rules and regulations served a purpose – they gave us a framework, a way to behave, a way just to be, at a time in our lives where we need help the most – when we are bereaved. We in the modern world have nothing. We have abandoned the ritual, but we still do not talk about death. That is just as true now as it was almost thirty years ago when my father died. I suppose it’s no coincidence then that my first interest in Mexico arose in the year following. Today, everyone has heard about the Mexican Days of the Dead – that grand celebration of ancestor worship mixed with an all-round knees up of a street party. Mexico has a very uncommon relationship to Death – Death is much more in the open in Mexican culture, and seems to have always been. 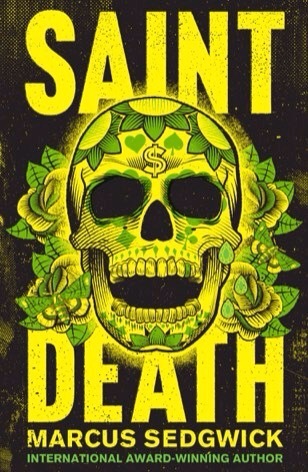 The latest evidence of that special relationship is the cult of worship of the folk saint Santa Muerte – Saint Death – who provides the title and theme of my new book. (Yes, sorry, I do indeed have a book to plug). Despite being banned by the Pope, devotees of Santa Muerte are growing in number according to the available evidence. No one is quite sure when or where she originated but today she’s a guardian angel to a wide range of Mexicans: the poor, the rich, the strong, the weak, prisoners, prison officers, prostitutes, young kids and grandmothers, family men and narco-lords alike – all turning to her for protection, guidance and often, material gain. The really interesting question underlying all this activity in Mexico is whether the people there really do have a happier and healthier relationship towards Death. Most often you will hear it argued that they do – it’s self-evident in festivals like the Days of the Dead and the worship of Santa Muerte. Yet occasionally you’ll hear that this open dialogue with Death has arisen very much because of Mexicans’ extreme fear of it, not their freedom from it. (I recommend Claudio Lomnitz’s excellent book Death and the Idea of Mexico if you want a serious discussion of the topic). For me, the two attitudes go hand in hand. We are all afraid of death, more or less, or start out that way at least. It’s what we choose to do about it that counts. And that’s why I think we need to make more ‘fuss’ when our loved ones leave us, not less. There are so few moments in life when we really get to acknowledge who we are, and what we mean towards each other – Death should absolutely be one of those times. So yes, we should wear black, we should have a code to live by and so on during mourning (and those of orthodox religions still do – one of the few good things about religion in my opinion – but there is not the space here to go into the relationship between increased secularism and the paucity of our behaviour towards Death). To end, let me jump to Switzerland. No, I’m not going to talk about assisted suicide. Instead, let me introduce you to Hans Castorp, who, if you haven’t read it, is the protagonist of Thomas Mann’s magnificent epic, The Magic Mountain. Living in a TB sanatorium in the Davos for seven years, Hans Castorp is surrounded by death continually. Yet, even without that, he decides one day that ideally he should like to wear black all the time. This entry was posted in Book, Guest blog, Santa Muerte and tagged saint death, Santa Muerte. Bookmark the permalink.